I hope everyone's day is going well so far. I had a chance to stamp early this morning, while everyone was asleep. This is my card for yesterday's MMSC, over at Priscilla's Blog. I flipped the sketch to make it work better for me, making it more of a horizontal card rather than a vertical card. 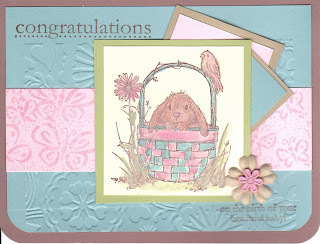 This is a card for a friend that just had a baby girl, so I used Pink Pirouette, Baja Breeze, Certainly Celery, and Cocoa. The bunny is from the retired SU hostess set, Serene Spring. I stamped it in Cocoa ink and then used blender pens and chalks to color it in. The rest is all self explanatory. The sentiment, which turned out a bit blurry with the scanner, is from the "Congrats" Sale-A-Bration set from last year. Well, I'm off for a little while, am going to try to stamp SCS sketch later today, if I get a chance. Until then, have a great day! Hi Dori :) What a sweet card. Your friend will love it :) Love all the details you leave about your cards. Thanks so much for playing the Midnight Madness sketch challenges with us. Lovely, lovely card. I love the soft colors and that little bunny is precious. Thanks for playing with us this week. See you next week. Oh so sweet! How can you resist that cute little bunny?! Perfect dry embossing too. Thank you so much for playing with us this week. It is our pleasure having you join us, and we hope that you will keep playing along. If you like blog candy, I have some really fun stuff up for grabs right now. Pop over to my blog and check it out. oh this card is so sweet..and the sketch terrific! TFS! What an adorable baby card! Love your image, coloring and embellishments! Lovely take on the sketch challenge. Thanks so much for playing along with us in the sketch challenge at MMSC! Great card and I like the sketch! Congrats to your friend on her new bundle of joy!!! So precious! Wonderful papers and colors! Great job! Blessings to you! Fabulous! I love your soft colors. Dori how sweet and adorable. I love all the embossing. It is so attractive and has great eye appeal. Thanks for playing the MM challenge. I look forward to seeing your creations again next week.